Super Savings Item! Free Shipping Included! 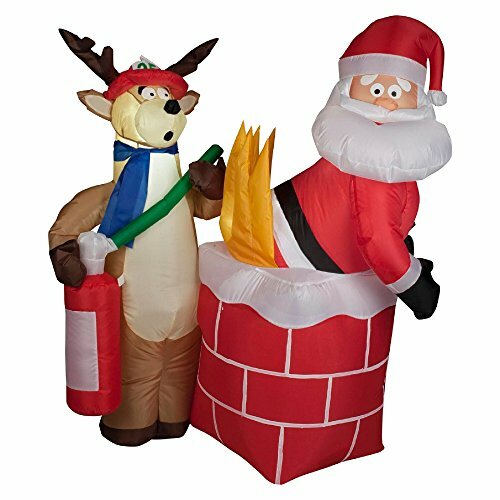 Save 35% on the Gemmy Inflatable Holiday G08 87191 Air Blown Santa on Fire Scene Decor by Gemmy at Two Clock. MPN: G08 87191. Hurry! Limited time offer. Offer valid only while supplies last. The inflatable Santa on fire features an abashed Santa Claus with his bottom in flames. He has clearly just come up from a delivery that went awry. The inflatable Santa on fire features an abashed Santa Claus with his bottom in flames. He has clearly just come up from a delivery that went awry. Luckily, a Reindeer is available with a fireman's helmet and fire extinguisher. Kids will get a kick out of this blundering version of the man in the red suit. 4 ft. Light up air blown Santa on fire Christmas decoration is safe both inside and outside comes with a UL power supply takes mere seconds to Inflate itself after set up is easy to deflate and fold away in storage for next Christmas features a Santa on fire with a Reindeer putting out the flames lights up so it can be seen in the Evening.